Why you should avoid plastic food steamers in your kitchen. Avoid plastic food steamers, and go for bamboo or stainless steel instead. If you have a food steamer in your kitchen, it is probably here for one of two reasons. 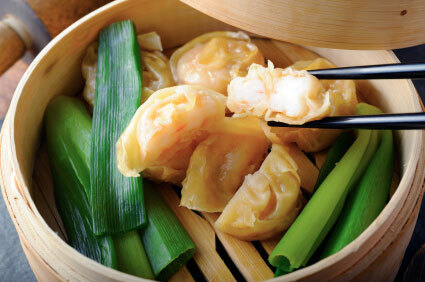 First, maybe you love steamed food, whether you are cooking vegetables, noodles or shrimp. Second, maybe you appreciate the health benefits of steaming your food. Your vegetables don’t get boiled to mush in a pan of boiling water, losing much of their nutritional value in the process. And your shrimp don’t soak up artery-clogging oil in the frying pan. Or perhaps you steam your food or both reasons, the taste and the health benefits. One way or another, if staying healthy is part of the equation, you need to check out any plastics that are used in the construction of your steamer. And yes, in particular you’ll want to know if the tiered steaming bowls are made of plastic. If they are, check out the recycling number. If it’s #7, the plastic is likely a polycarbonate plastic, and that means it can leach BPA into your steamed food. As you probably know, BPA is an ingredient in the manufacture of polycarbonate plastics, and is one of a group of chemicals known as endocrine disruptors. These chemicals mimic the effects of oestrogen in the body and have been linked to numerous health issues in humans. Of particular concern is that BPA leaches out of these plastics more rapidly when the plastic is heated. So now we have this ironic moment – where you are steaming your food in order to benefit your health, but are at the same time unknowingly impregnating your healthy food with a dangerous chemical. Fortunately, there is an answer to this problem, even if you have to miss out on the convenience of an automatic steamer. Simply take the old-fashioned path, and use a bamboo or stainless steel steamer. True, there is no timer or automatic shut-off when using a bamboo steamer, but at least you won’t have to worry about poisoning your otherwise healthy food. Bamboo and stainless steel steamers are usually available in the kitchen section of most department stores.